I don't review games on Steam very often. But this one is special so I thought I'd mirror it on my blog. This is the most emotionally challenging game I've played. But I expected that. The developer walked a tightrope between genuine creative expression and potential sensationalism. I'm certain they struggled with this. 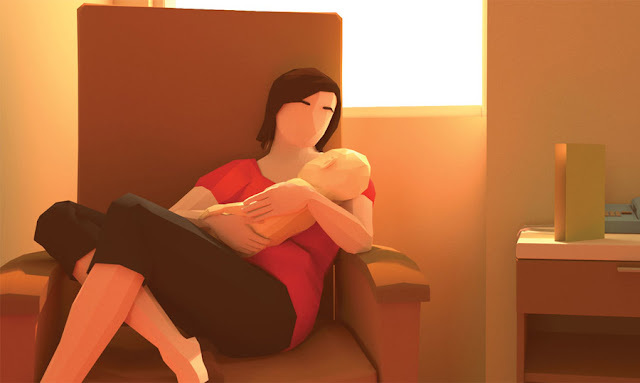 At its heart, "That Dragon, Cancer" gives us a very intimate perspective of a family's struggle with cancer, diagnosed in their youngest and most vulnerable member, baby Joel. Throughout the game, baby Joel becomes our baby. Your baby. And that's where it hits you hardest. That's where it does something no other game has... AND that's where it does something ONLY games can do! The art style is simple but effective. Player interaction is also simple, relying mainly on you looking around for cursor prompts to click on. I often felt as though I was waiting on the game to catch up on my intentions. But the game surprised me often enough to keep me interested. And of course, I was busy looking after baby Joel. For all its flaws, the game is only successful to me because it forced me to care. And that's something few games do. Are games the proper medium for this type of content? Maybe. There are a million ways to do this WRONG. But the developer did a lot of things right, and I want to recognize that. This is dangerous territory... And though I'm not a Christian myself, I recognize grace. I'm proud of them and I want to support games like this. This is not a fun game and it defies most of the criteria we use to judge games. That is also precisely why it is worth playing.